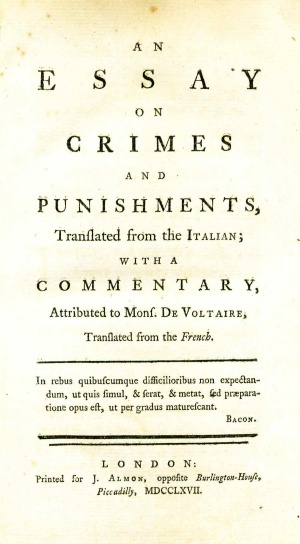 An essay on crimes and punishments translated from the Italian of Cæsar Bonesana, marquis Beccaria. by Beccaria, Cesare, marchese di, 1738-1794; Voltaire, 1694-1778; Ingraham, Edward D. (Edward Duncan), 1793-1854. Publication date 1819. Topics Crime, Capital punishment, Torture, Punishment, Law reform.